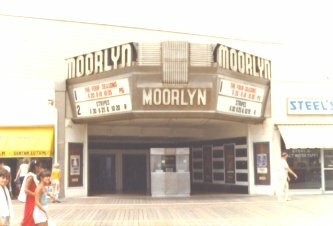 The Moorlyn Theatre opened as a boardwalk bowling alley between 8th and 9th streets. 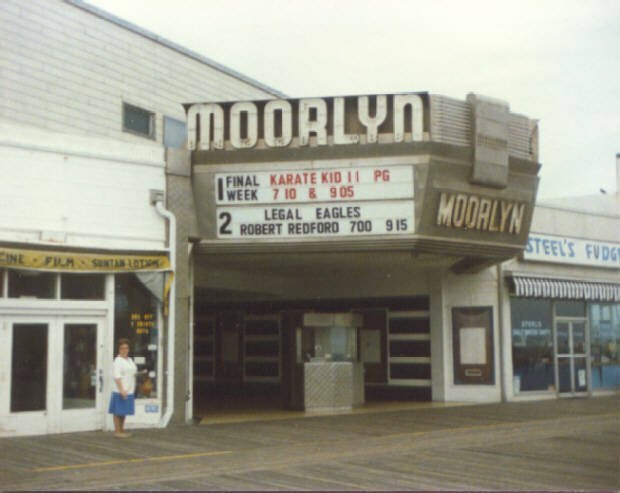 Sources indicate it was called Moore's Bowling Casino, owned by Ocean City Casino Co. As best as I can tell, it was built around 1905, perhaps earlier. 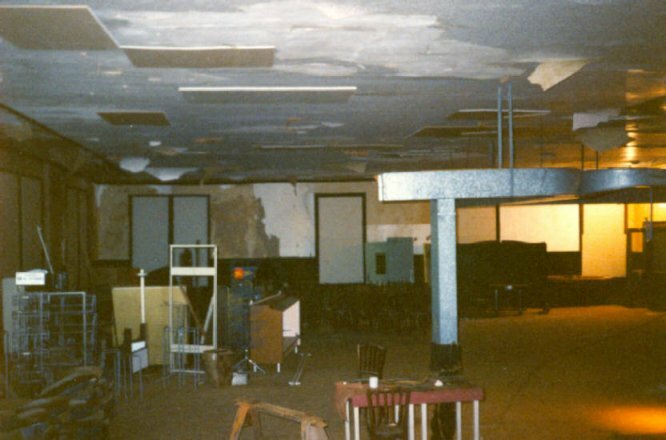 The second floor included a large dance hall, with a stage for the band. Vacationers could spend an evening out, dancing, with the ocean breeze drifting through the large windows. Upstairs there were six small apartments. Empty since the 1940's and covered in dust, they still had items like soap bars, curtains, and paper towels in 1989. 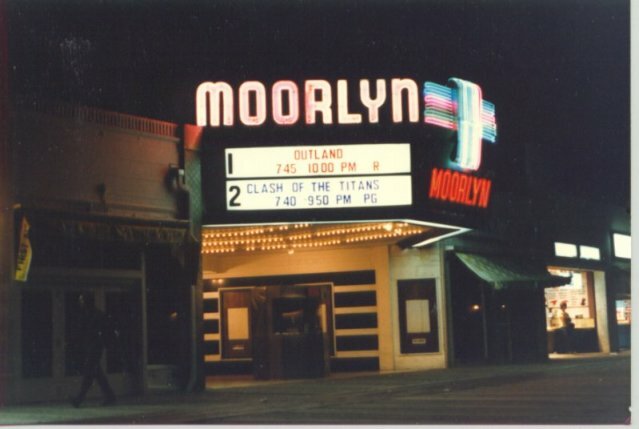 At some point, it changed from Moore's to the Moorlyn. 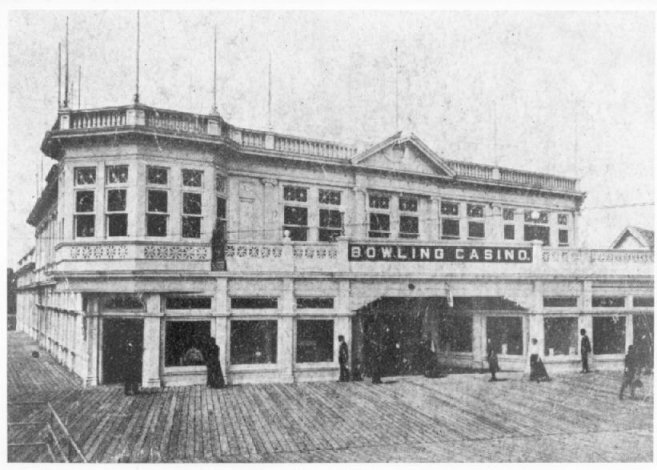 Around 1923 (according to surviving blueprints) the interior floor was angled for use as an auditorium, a large stage with fly space was added, and the Bowling Casino gave way to the Moorlyn Theatre. 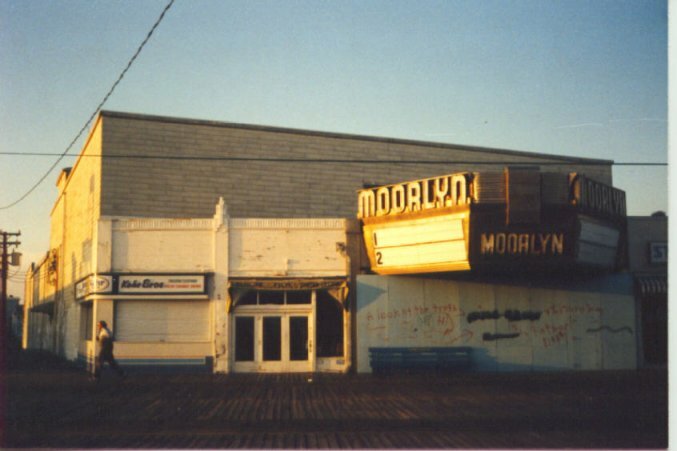 The theatre presented vaudeville acts and "photoplays" or silent movies. An organ provided accompaniment to the films. 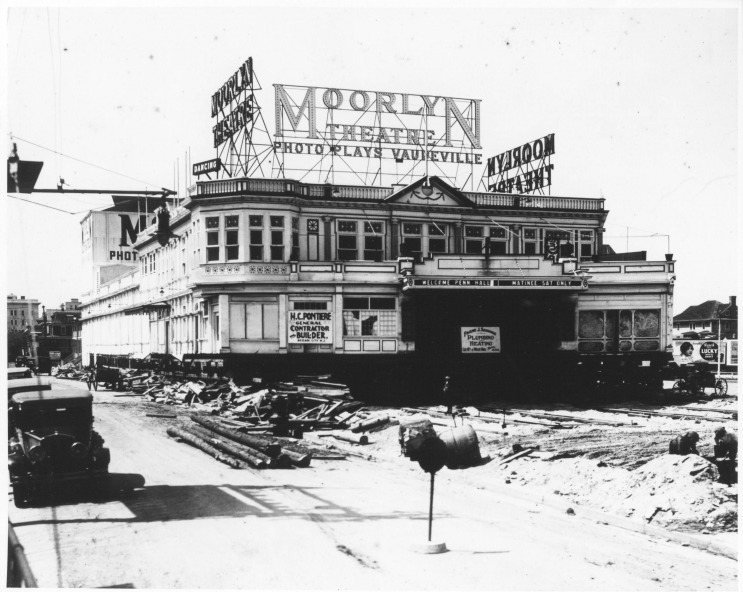 The fire in 1927 destroyed most of the boardwalk, but spared the Moorlyn Theatre. 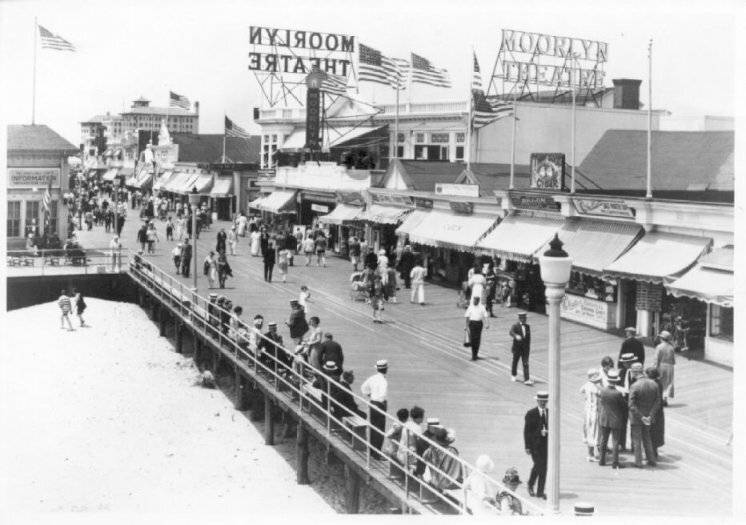 When the boardwalk was rebuilt, a block closer to the ocean, the Moorlyn sat for a year in it's original location before being dragged up to the new boardwalk. The new Boardwalk is built and Moorlyn Terrace is extended to meet it. The Moorlyn sits where the old boardwalk was, with temporary ramps for customers to enter. 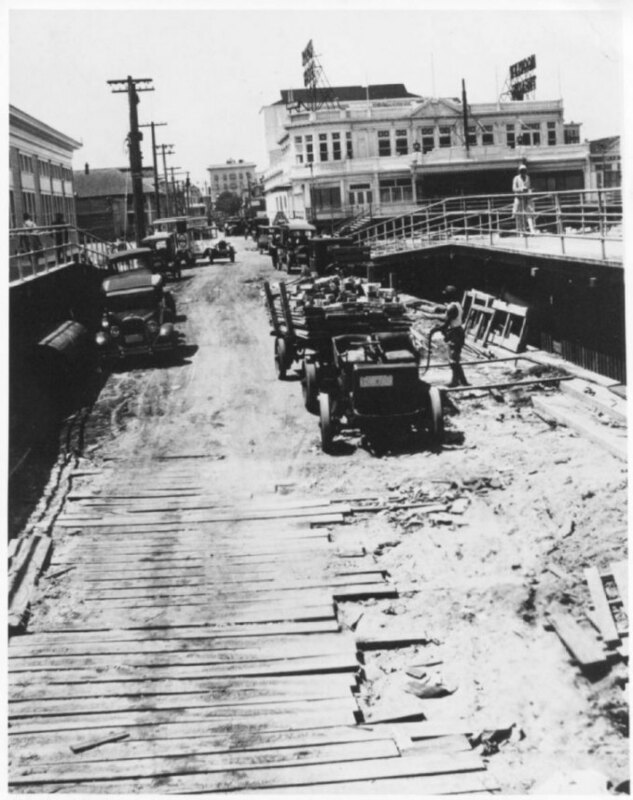 The Moorlyn sits on the right, with construction on the left. Finally the Moorlyn Theatre was pulled up to the new, finished boardwalk. 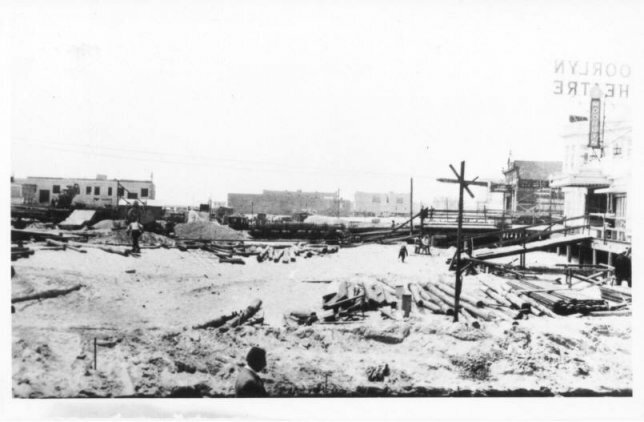 Note the tracks laid in the sand, and the new Moorlyn sign which towers over the building. 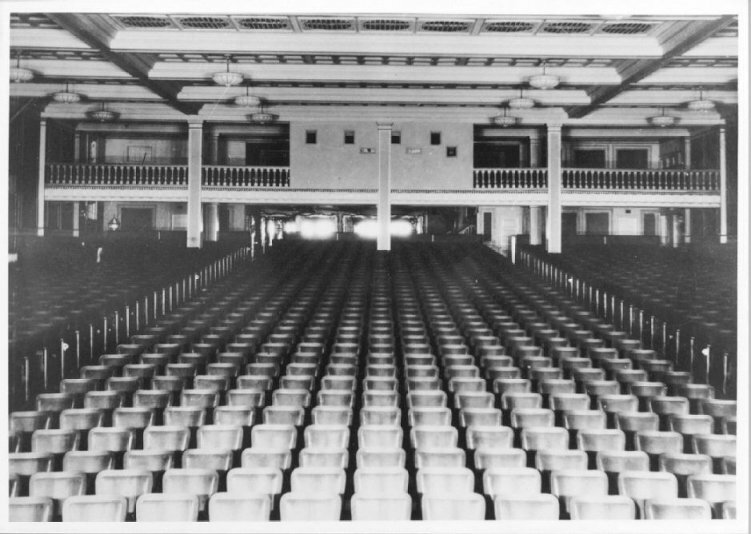 A sound system was installed in the theatre in 1929. Having been pulled up to the new boardwalk, the original site of the Moorlyn is now a parking lot behind the theatre. 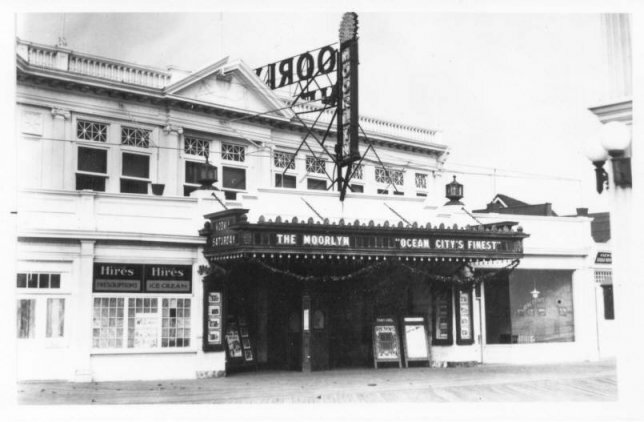 In the early 1960's (possibly earlier), the distinctive exterior of the theatre was covered over with simple asbestos siding. 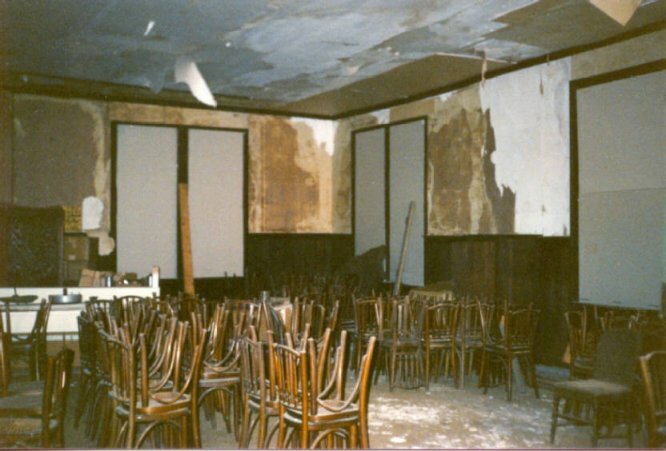 The large windows in the upstairs ballroom, overlooking the ocean, were covered over. The tall stage, no longer used for live shows, was removed. 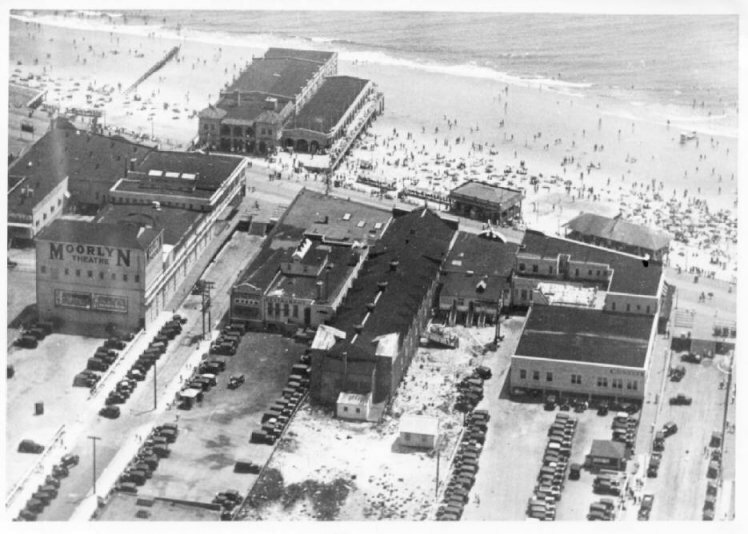 By 1970 the theatre, which had originally held 2,000 seats, had been divided into a twin theatre, the first on the boardwalk. The theatre was maintained as a twin theatre until it was sold in 1989. Interior. 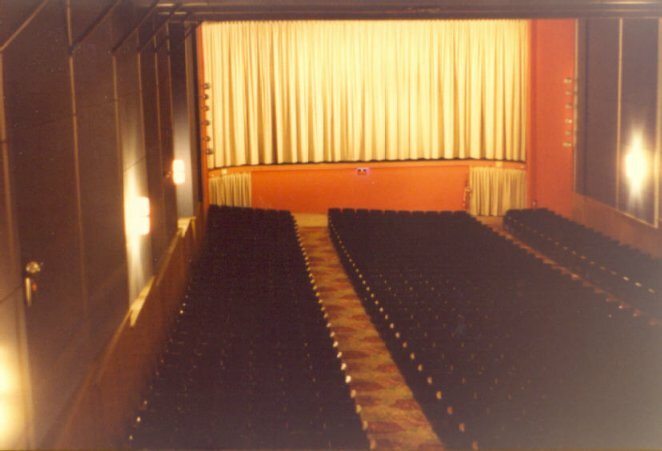 The larger of the two auditoriums, with working curtains. The outer lobby as you enter on either side of the candy stand. 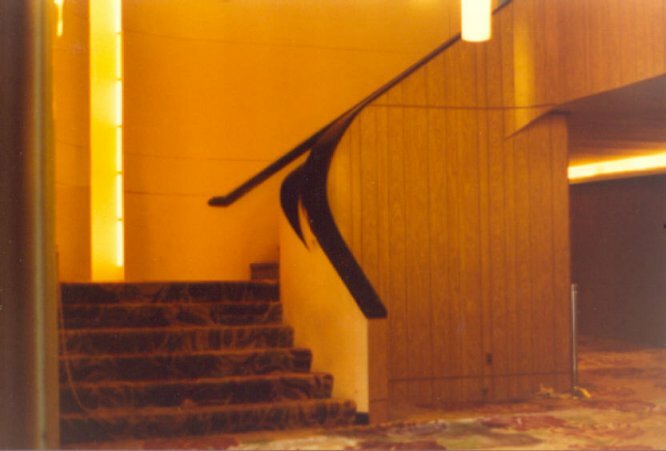 The stairs to the balcony with Lumiline cove lighting in the curved wall. 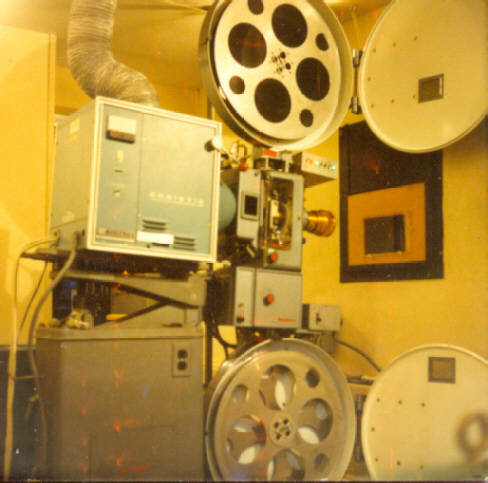 The projectors for the larger theatre were used to light the single, giant screen before the theatre was twinned. These Strong Excelite carbon arc lamps were replaced with Xenon lamps in the early 1980's. 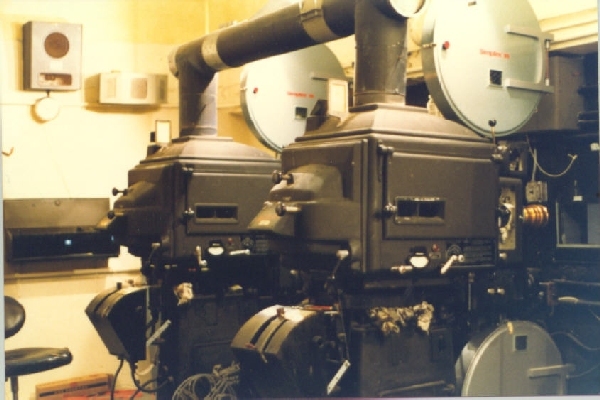 When the theatre was twinned, two Simplex 35 projectors with an automatic changeover system were installed for the new auditorium. No platter system here. 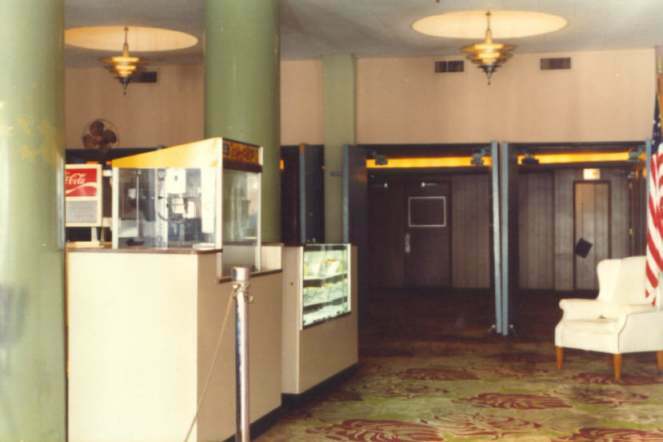 The outer lobby and candy stand. 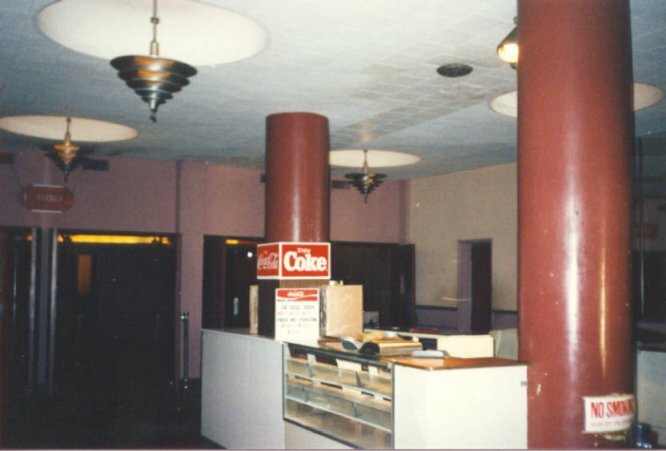 The Art Deco ceiling fixtures were from the 1950's remodeling. 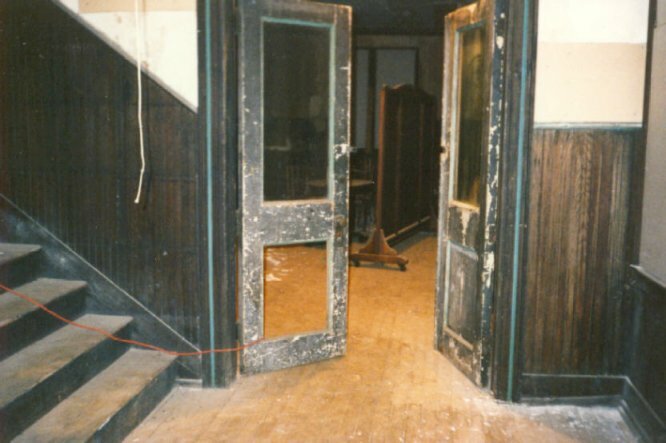 The upstairs ballroom doors open into a large dance hall that hasn't been used since the 1940's. The space is now used for storage. 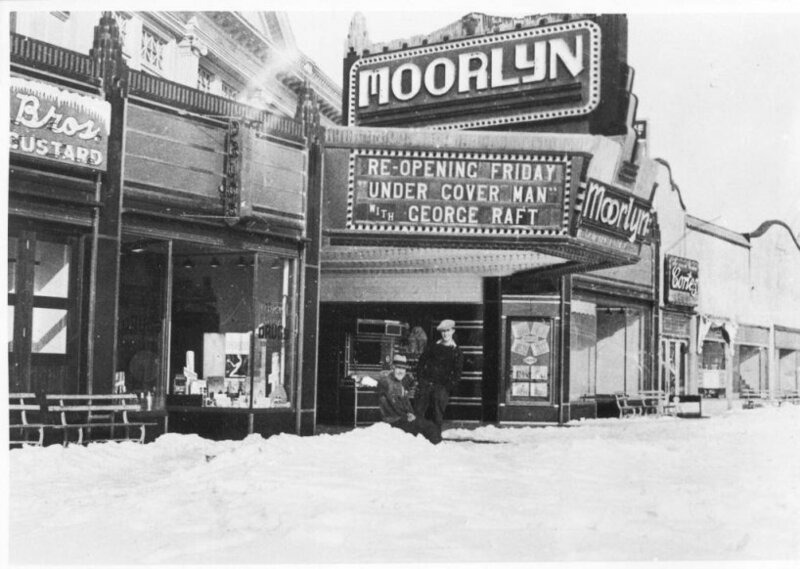 The theatre, owned by the Shriver family since the 1920's was sold in 1989.